The camera: Kodak EasyShare LS753. It’s my first and only digital camera, and I’ve had it for about two years. It has a good zoom, 5 megapixels, and a rechargable lithium battery — all I need in a camera. I’m pretty sure that by now there are newer, faster, better, and less expensive models (though mine was very reasonable). The yarn: Manos del Uruguay Color #113, Wildflowers. The colors are really different from skein to skein, so I’m mixing it up every few rows. I’m using US 7 needles, and getting 4.5 stitches per inch. Just right. 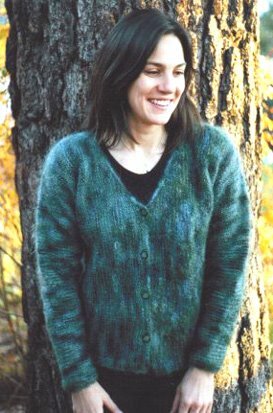 The pattern (just in case anyone is wondering): Knitting Pure and Simple Women’s Side to Side Cardigan. You all are really the best supporters an Olympic Knitter could wish for! I can see all your Team USA banners and foam fingers out there, and I’ve saved all the teddy bears and roses you’ve tossed from the stands. You’re too much. Really. Enough with the teddy bears. I’m also so touched and gratified by the support of my fellow OKers that I’m getting a bit emotional, so I must be going now. Knit on, everyone. Go, Jane, Go!!! Woot woot! Did you see me waving “Jane Rocks!” the sign from the stadium? The new scoring system is really confusing me – do you get bonus points for frogging? Also, remember that grandstanding may cost you a medal….Ahhh, who cares -GOOOOOO JAAAAANNNEEE!!!!! I’m not doing the Olympics (its too hot here) but I am willing to cheer on those who are. Great job. I love the sweater. Also I love the colours of the varigated one you are working on. Thanks for the info re camera, pattern & yarn.As a major Jane fan, I am cheering you from the sidelines.As Frazier would say, dear God, is someone throwing bears from the sidelines? Has anyone reported this to PETA?Did you know I tagged you? A report on five items from your frig please.XOXO to you.